I like feet on cutting boards. At the Brooklyn Flea this weekend had a few chats with customers about rubber feet on cutting boards and thought it could be helpful to recap some of the info here. All of our bigger boards have rubber feet on them, and the feet serve two purposes - providing some grip to keep the board in place, but also to keep the bottom of the board out of the water. Lots of "serious" boards claim to be reversible and don't have any feet as a result, but then you either need to rest them on a damp towel or deal with them sliding around. The worst thing for a board is to stay wet for an extended period of time. If you're especially diligent, perhaps not a problem, but if you're having friends over and the night goes on and on, cleaning the kitchen is the bottom of the list. And stuff gets spilled on the counter. Or some water from the sink. Not everyone is in a professional kitchen, or has help, or has the room to move large boards around in kitchen full of dirty dishes. They'd rather leave the board in place most of the time and just give it a good wipe. And some oil some other time. And people do, and it's fine. But without feet, it can cause you trouble down the road. Talking to folks at the Flea, heard of cutting boards that have warped and cracked (or worse, they'd say "in my kitchen, my cutting boards always warp and crack!" - like has happened to them multiple times...). Also stories of the bottom getting moldy and gross. Eww. So much for "reversible". See more on the Press page. Cutting Board Class - Pictures! Make something you want to live with. Kate Nyland wrote this great post about the class we just wrapped up and the board she and her husband made. 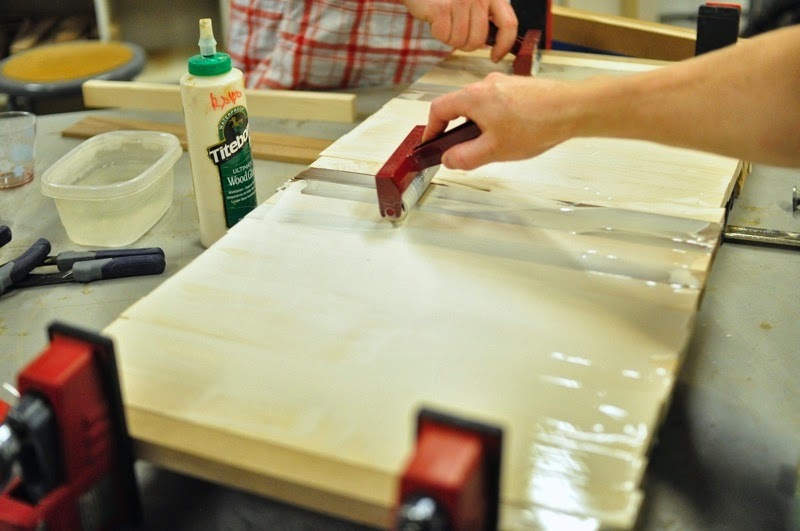 Good times had by all, and all made some really pretty cutting boards. Full report coming soon. Next class is April 20 & 27. We held the first half of the two session class last Friday. Smashing success. We talked all about cutting boards and woodworking and furniture making, then proceeded to arrange and glue up some boards. The class made 6 very lovely ones. I was very enthusiastic about the whole thing and forgot to take real photos (and those who know me are likely not surprised), but will have some from this week's class as we finish the boards up. We made Kentile-style boards, but had the added variety of thinner pieces of walnut and maple, as well as some cherry, and that all made for some interesting patterns and boards that can't be found anywhere else. I really like the idea of using something personalized you made yourself to make your dinner. This one is monogrammed with PZH. The "P-Z" for her are the two columns at the top. The "H" for him are the four lines below. It has the lip on the front and that nifty well on the right. Each "dot" was made from the same piece of walnut, and can see how each piece had a range of tones. You can see the progression from left to right. I love how that came out. I'm really liking these maple boards - the subtle color variations and patterns always appeal. Just finished some more custom boards. This first one was a challah board, monogrammed with an L for lechem ("bread" in Hebrew) and a small well to hold salt. This other board was monogrammed with "AMA" down the right side, with a well to hold wily vegetables or onion skins, and a board scraper. The cutting edge of cutting board design. What do you think of the thin stripes in the well on the left?